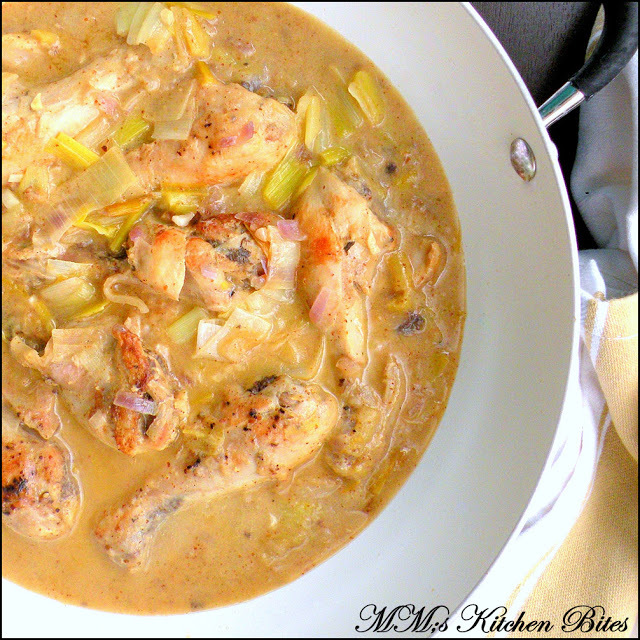 Home chicken Chicken with Leeks in a Creamy Mustard Sauce…faster than Bolt! Chicken with Leeks in a Creamy Mustard Sauce…strange how some regular recipes never get on the blog…it wouldn’t have even today, but luckily the sun came out for a bit and I rushed to my window spot to click…I swear I would have beaten Bolt today by a mile and this even though he runs without a hot pan in his hands!! J…OK, so ideally I should have taken a picture of this all plated up as well…but let’s save that for another sunny day. Heat 1 tbsp oil + 1 tbsp butter in large non stick pan with cover and then brown the drumsticks on all sides on medium high heat. When the garlic just starts to soften, add in the onion and leeks, stir well and cover the pan. 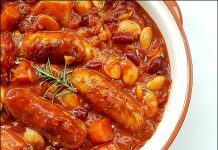 Remove cover and stir after 3-4 minutes – the reason to cover is to get onions and leek to soften up in the steam without getting brown. Add the stock to the pan and stir in the mustard. Increase the heat and let the stock come to a quick boil. Reduce the heat to low, add in the chicken and cover the pan. Let the chicken cook for about 30 minutes. Add back the leeks removed earlier and let it cook uncovered for another 10 minutes or so till the chicken is completely cooked and sauce is of nice consistency. Gradually add the cream, a bit at a time. Let the sauce simmer on the lowest heat for about 3-4 minutes. Taste and adjust seasonings, adding more salt and pepper as necessary. We like the bite of the leeks in the final dish and that’s why cut the leeks about an inch thick and then remove part of it after they soften a bit. If you would like the leeks to completely ‘melt’ in the sauce cut them fine and let them be in the pan throughout the cooking time. You can also add mushrooms if you want.Slice them into thick pieces and add them along with the leeks and onions. No leeks? Make using shallots or white onions. Add a cup of shallots or white onions instead of the leeks. There are times when I skip the cream completely– you know during those ‘I want to eat healthy phases’. The leeks anyways add to the creaminess and smoothness of the sauce. Would suggest that you do a taste test before adding the cream to see if you want to add cream and how much. 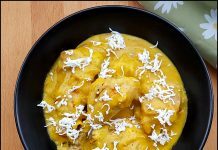 Instead of starting with bone in raw chicken, you can use leftover shredded roasted chicken and toss it in the sauce along with the cream. If using boneless raw chicken chunks, sauté them first and then add back in the sauce once leeks and onions are completely cooked to your liking in the stock. Previous articleOven Roasted Mung Dal…why stop at just one!! 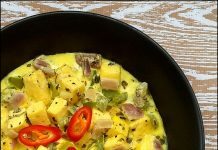 Next articlePaneer Bhurji…hard work pays!!! This looks fantastic. I love the combination of leeks and chicken – one of my favourite recipes is a chicken and leek risotto, add cream and I am in heaven! I'll have some bread to mop up this nice sauce! Oh my goodness. I added two chopped rashers of bacon to the chicken and some cubed parsnip to the veg and it was AMAZING. SO tasty, this will definitely be made again!